This First Aid at Work course covers the syllabus as set out in the Health and Safety Approved code of practice. This course entails taking practical assessments on the final afternoon. Passing the assessments entitles the holder of the certificate to be registered as a First Aider. The certificate is currently valid for three years. It is a highly participative first aid course with both tutorial and practical sessions. This First Aid course does entail getting down onto the floor to do practical work. This course can be delivered as on site training at your location or we can provide a room at our location in Shirebrook Mansfield, Notts if you do not have one. It is also delivered as an open course at our location where any one can attend all course dates are on the open courses page. Course fees cover registration, exam fees, book and certificate. Upon completion of the course a certificate will be issued this is approved by the First Aid Industry Body which is valid for three years. HSE “STRONGLY RECOMMENDS” that an annual refresher training course is attended every year ! 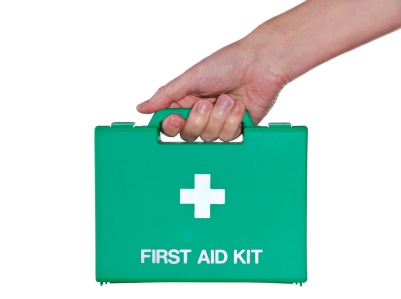 We also deliver the two day First Aid at Work Refresher Course when your certificate is due to expire. We have free parking on site. Should delegates require an annual update (usually 3 hours) this can be provided – contact for details. All open courses are held at our company training centre in Shirebrook Mansfield, Nottingham. Click on the course name next to your preferred date and time, and book online today. If you prefer an on-site course held at your location, click here to book an on-site course.